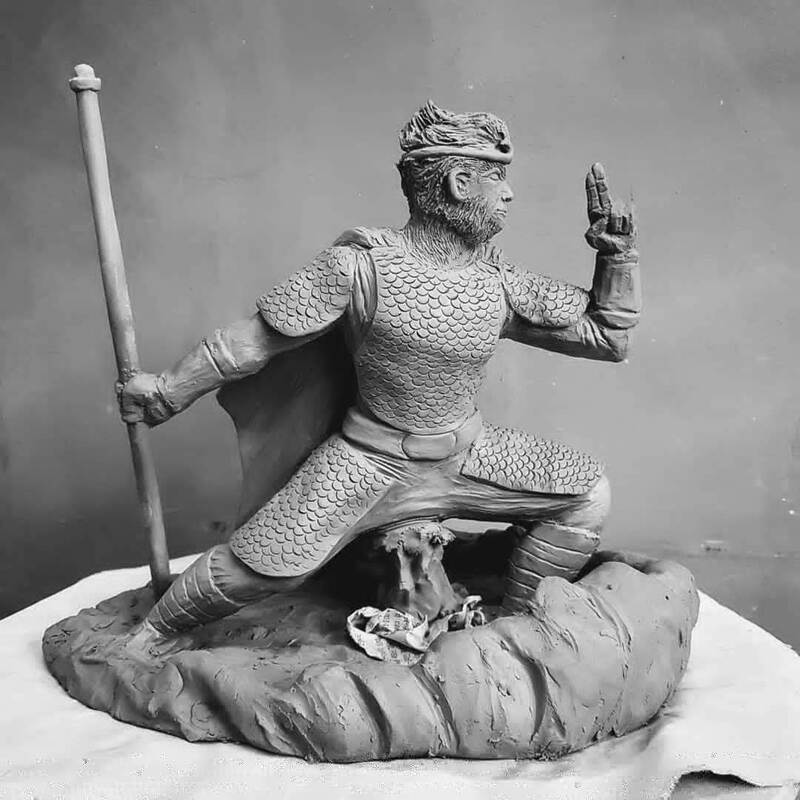 Sun Wukong, also known as the Monkey King, is a fictional figure who features in a body of legends, which can be traced back to the period of the Song dynasty (960 to 1279 AD). He is best known for his role in the classic 16th century Chinese novel "Journey to the West." Sun Wukong possesses supernatural strength and various magical abilities. In the novel, his metal crown (ringlet) is actually a restraining device which shrinks at the command of his master Tang Sanzang, producing an unbearable headache. While there are countless interpretations of Sun Wukong, I chose to depict him in his golden armor (Song dynasty style, which he took from the dragons of the four seas) riding atop a speeding cloud (thanks to his cloud walking boots), holding his magical staff (which incidentally weighs 8.1 tons and can shrink to a size of a sewing needle which he tucks behind his ear). My thanks again to the Ceramic Art Studio and Shop. The bottom of the staff bent as it softened during glaze firing - good thing this is a magical staff and was in the process of changing its size! Flying fish (Exocoetidae) are found in in tropical and sub-tropical sections of all oceans. They possess an extraordinary ability to leap out of the water and glide long distances, wind-assisted, to evade predators. One specimen was recorded gliding for 45 seconds over a distance of about 160 feet. Their aerodynamic bodies and fin curvature have striking similarity to modern aircraft fuselages and airfoils. As a food source, they are consumed in just about every oceanic culture, and their bright orange roe is a prevalent delicacy in Japan and Korea. Flying fish produce beautiful zig-zagging patterns on the water's surface as they take off, which I also wanted to capture as part of this piece. Four different shades of celadon glaze was used along with underglaze for the fish and the ocean. My thanks again to the Ceramic Art Studio and Shop. 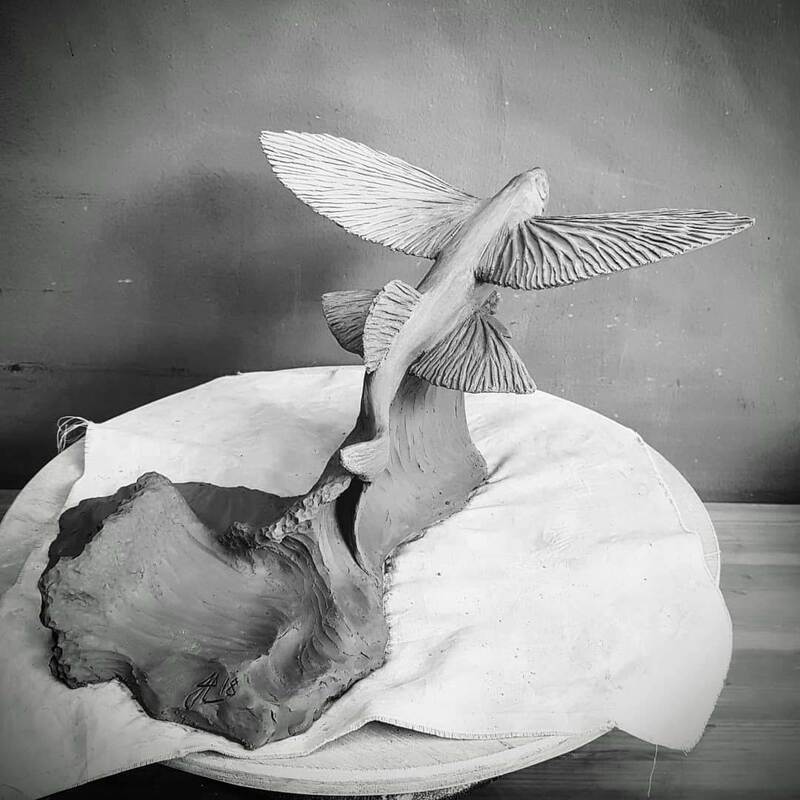 I had initially set out to sculpt a two-part Icarus themed pieces. "Flight I" was supposed to depict Icarus soaring confidently into the sky, and "Flight II" was to depict him falling from the heavens, as per the popular Greek mythological tale. The problem arose when I realized I could not sculpt wings - decent and sizable wings - that the engineer in me could accept even as a stretch, to supporting human powered flight. Then the happy accident occurred. 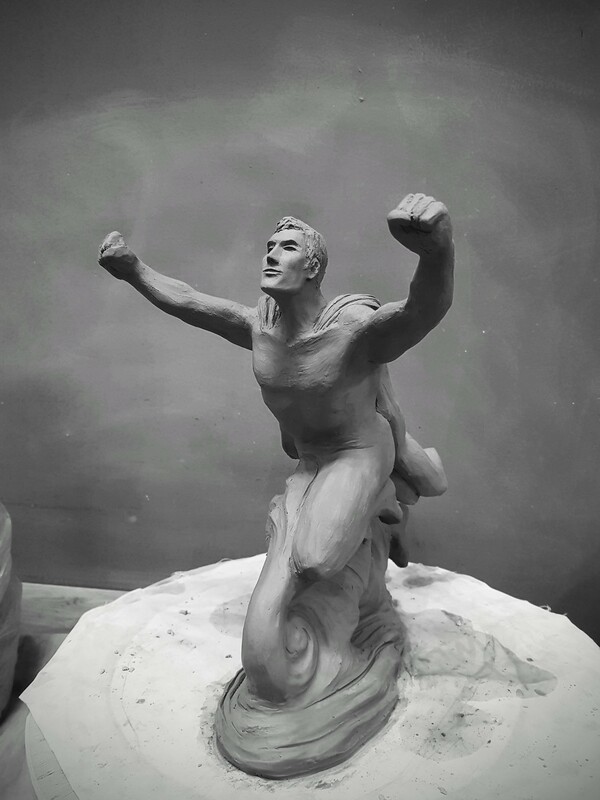 As I began sculpting the face, Icarus' jawline and cheekbones reminded me of Christopher Reeve. The pose was almost perfect, the outstretched arms of Icarus (meant to support the waxed wings) transformed into a classic flying form of the last son of Krypton. Similar to my minimalistic approach with Thor, only a cape (and a spit curl) was necessary to convey the essence of Superman. My thanks again to the Ceramic Art Studio and Shop. There are numerous goddesses and other mythological beings throughout history with winged appendages - angels being the most recognizable in present times. 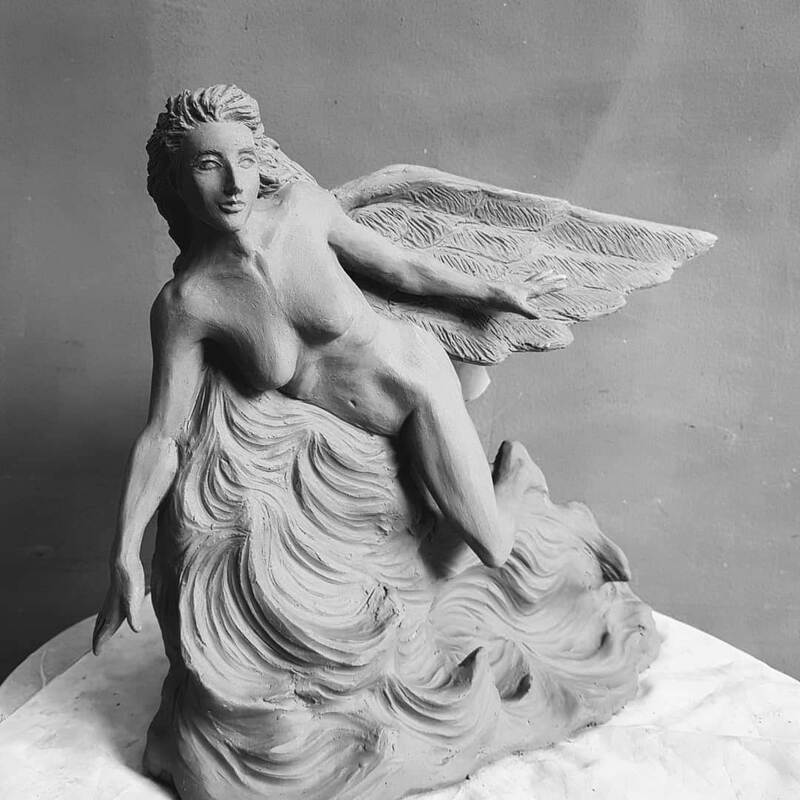 Most winged female figures featured in legends and myths often play the role of a messenger, guardian, or celestial host. Some famous winged female figures in mythology and legends are Nike (Greek), Victoria/Victory (Roman), Isis (Egyptian), Valkyries (Norse), and of course angels and fairies. My thanks again to the Ceramic Art Studio and Shop.